There comes a time when even new things start becoming boring. Just a few years ago, fingerprint scanner seemed like a futuristic feature. And now, almost every new smartphone comes with a dedicated fingerprint scanner. After that, 4 GB RAM looked like something new and once again, it is now a common thing. The point is that every smartphone company is following the same trend of increasing the screen size and battery with a 4 GB of RAM and fingerprint scanner. However, Asus decided to do something out of the league with their latest smartphone, Asus ZenFone Zoom. The concept of a Zoom Lens in a smartphone is not new. Samsung also tried it two years ago with Galaxy S4 Zoom but, things didn’t go well for it. The reason for the failure of Zoom Lens in a smartphone is that it makes the phone bulky and more of a digital camera. Asus understood this and came up with a phone that features a Zoom Lens but doesn’t affect the design and thickness. So, the question is, will Asus ZenFone Zoom will be a big hit or it is just a hype. Looks & Design: Something different but, only on the back side. When it comes to looks and design, all Asus Smartphone looks similar. On a first look, the ZenFone Zoom looks identical to ZenFone 2 but, just flip it and you will see the difference. The big round lens covering half of the back is something which you don’t see in every smartphone. 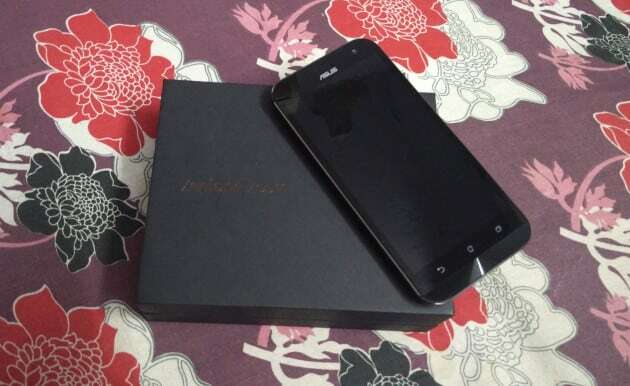 The device features unibody aluminium frame and concentric circle on the front bottom of the phone, a design which works as a trademark for Asus devices. The rounded sides and chamfered edges add to the beauty of the phone. The thick bezels and absence of backlit in the capacitive navigation buttons are one small downside of a device but, it doesn’t affect much until you are a complete design and looks freak. Another new thing in the device is on the right side. There is a two-step camera shutter button along with a button for video recording which opens the camera in milliseconds. Rest volume rocker, USB port and audio jack are placed where they should be. 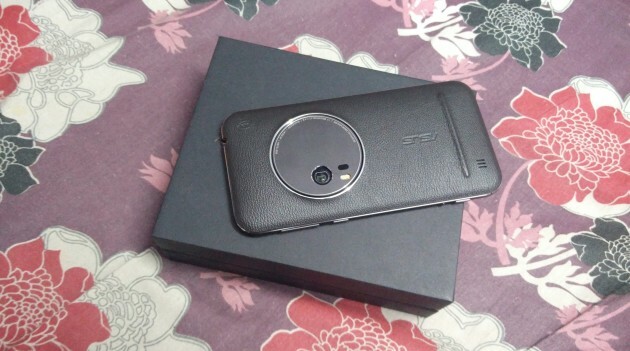 On the back side is a real leather back cover where Asus has cleverly fitted the zoom lens. It does protrude a bit but, not to an extent to make it uncomfortable to place or hold. Kudos to the Asus for fitting an Optical Zoom lens in a phone and still keeping it only 11.9 mm thick. Overall the build quality and design of the device is good and fresh but, only from the back side. Once again, Asus has partnered with Intel and is a powered by a Quad Core Intel Atom Z3590. It is supported by a 4 GB of RAM and houses 128 GB of storage. Sadly, there are no other storage variants but, you can expand the storage up to another 128 GB via a microSD card. The phone supports NFC and fast charging which is becoming a must nowadays. The 3000 mAh battery offers a decent performance and thanks to fast charging, it can be charged up to 40% in just half an hour. The device runs on Android Lollipop which is fine as Marshmallow is yet to hit all the phones. The ZenFone UI was never a problem and the company has worked a lot to make it even better. You will get many pre-installed apps most of which are actually useful. The bloatware is less and you can uninstall the app which you don’t need. There is no doubt on the performance of the device as it can easily handle heavy multitasking and high-end graphics game. Camera: The best in the class? Talking about the USP of the device, it features a 13 MP rear camera supported by a 10 elements lens manufactured by Hoya. The best part about the Zoom lens is that it is fitted in such an excellent way that lens doesn’t extend outwards even when you wish to get a 3X optical zoom. Laser autofocus and Optical Image Stabilisation makes it a perfect companion for photography lovers. No matters whether it is used indoor or outdoor, the camera yields excellent shots. Even at 3X zoom, you will not find a single blur. The company claims that the phone can focus objects which are placed at as close to 5 cm. Another feather in the Asus’s cap is the Camera app which offers a large number of shooting modes and quick toggles. The manual mode allows you to play with ISO, aperture and even shutter mode. The only thing which we think is missing is 4K. Yes, there is no 4K video recording option and you have to adjust with 1080p. There is nothing much to talk about 5 MP front camera which clicks decent selfies. Clicking good images even in low light is what makes Asus different from other and ZenFone Zoom is not an exception here. At 37,999, ZenFone Zoom is a good deal for those who wish to have a camera and phone in one gadget without compromising on the design. The fingerprint scanner is missing but, you can’t have everything at this price. So, if you are a photography lover and knows how to play with manual settings, this is the phone you should think about.